Katja is an inspirational artist, mask and costume designer, ritualist, teacher, photographer, healer, and performer. She has exhibited her work in the Netherlands, New York, and Boston. Katja has studied ritual, maskmaking, different forms of movement and voice. She has created sacred ceremonies for the seasons since 1992 for small and large groups of people of which the Summer Solstice at America’s Stonehenge is most well known. She has been deeply involved in African based spirituality with Malidoma Somé and the East Coast Village, which has brought her to Africa a few times. She draws from a variety of great teachers such as Martin Prechtel, Rikka Zimmerman, Emilie Conrad, Eric Bornstein, and Tim Kelley. Katja facilitates rituals and gives talks at colleges and universities. She has taught Continuum based movement, courses in ritual, facilitates Grief Rituals, and Sacred Sound Circles. Katja has sung with Bonesong, an improvisational sacred singing quartet that originated in a cave. She performs with the Theater Behind The Mask in schools and other venues and has been seen at First Night Boston and as ‘Stringster’ at the Fisherman’s Feast for many years. She created a performance with video artist Gene Hall called ‘the Magic of Water in Motion’ based on our aquatic origins, and a performance around ‘The Hidden Life of Trees’ with Ricardo Frota, in which she appeared in a full tree costume that was in part funded by the Cultural Council of Watertown MA. As a roving tree, she performed at the Boston Flower Show, the Boston Garden, and the Hynes Convention Center. Thank you and credits for the images in the slide shows go to Bob German (for images of Katja, the women painting the Earth Mother at the foot of the oak, the arch of flowers, ribbons and corn) , Beth Bahia Cohen (for the tree performance indoors and the dancing tree spirit outdoors), Delwood Richardson ( for the tree spirit outdoors), Cyndi Claymatron Christian (for the two dragon mask images), Jay Rosenberg ( for the ocean spirit), and Katja Esser (for all the other images). 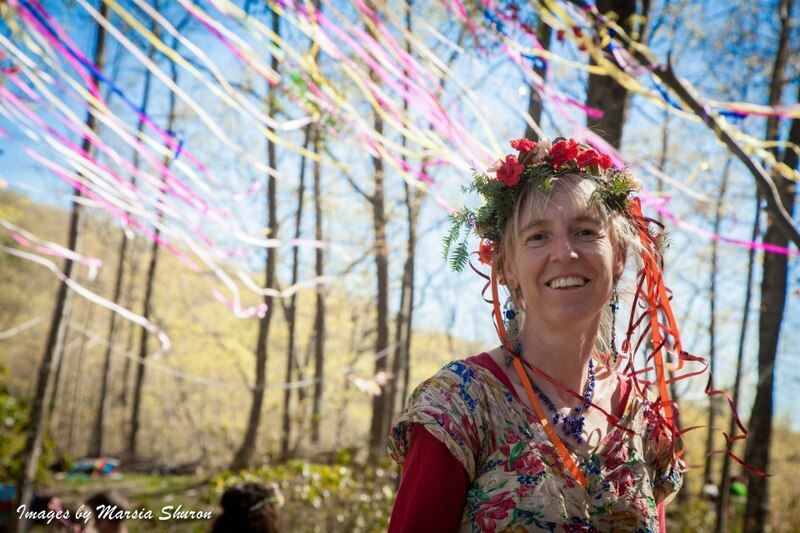 Thank you Marsia Shuron for this image above taken at Beltane 2013. Thank you Marty Cendroski for setting up this website to fulfill the artist’s needs.